The Fixman 24 inch Tool Box and Organizer is designed to get the job done. Perfect for the jobsite or the DIYer. The Tool Box features a removable organizer as the top tray, clear lid for easy visibility and a patented no-swing handle lock. Made of rugged polypropylene to provide greater strength through the body, high quality polycarbonate lid and durable aluminum for the carrying handle. It has locking metal latches to keep contents secure and safe. The DEWALT DWST38000 238.5 L Tough Chest is ideal for getting your larger tools and equipment to the jobsite. This chest is designed with 7-inch rubber wheels so one person can easily transport heavy loads. The top of this chest features metal rails that allow for extra storage options. The Husky 22 inch Connect Cantilever Tool Box features a convenient cantilever mechanism that gives you full access to your gear. The large, designed lower body holds power tools and large hand tools, while the upper body contains 12 removable small-part bins and a compartment for specialty tools. The full-body steel handle makes it easy to carry heavy loads. This toolbox is compatible the Husky Connect Rolling System and the Husky 15 Gal. Connect Mobile cart. It can be connected to the top of the Husky Connect Rolling System and the Husky 15 Gal. Connect Mobile cart. 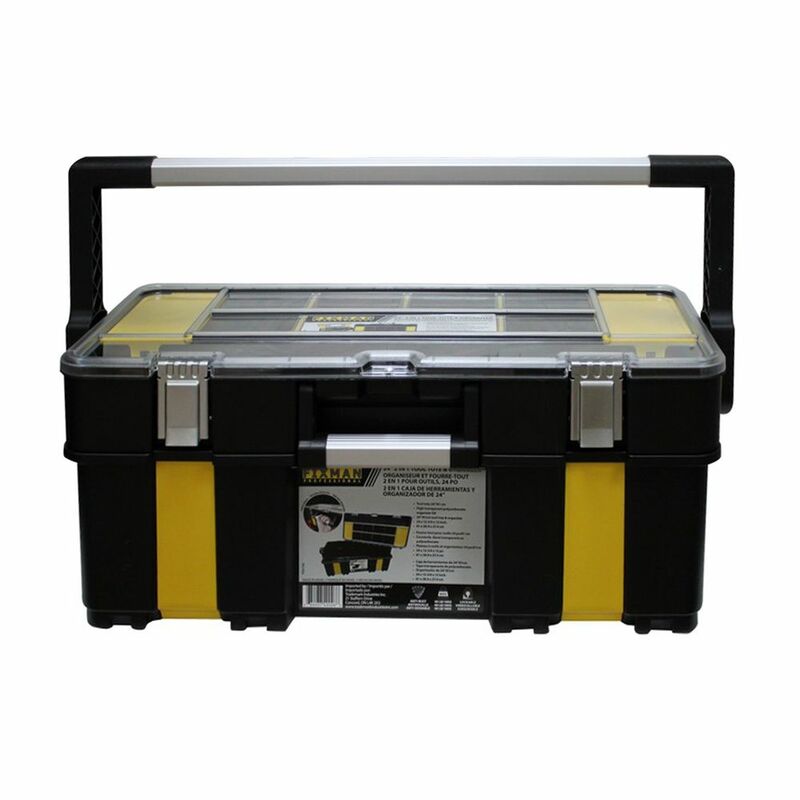 24 inch Tool Box The Fixman 24 inch Tool Box and Organizer is designed to get the job done. Perfect for the jobsite or the DIYer. The Tool Box features a removable organizer as the top tray, clear lid for easy visibility and a patented no-swing handle lock. Made of rugged polypropylene to provide greater strength through the body, high quality polycarbonate lid and durable aluminum for the carrying handle. It has locking metal latches to keep contents secure and safe.